The Kentucky court system has created standard forms that can be used by those who wish to represent themselves in a divorce with children. The forms discussed in this article can be obtained at your local courthouse. Kentucky Divorce With Children (Packet) Step 1: The first form here, the "Petition For Dissolution Of Marriage," is filed by you to initiate the divorce process. This document requires you to provide information about your marriage and all children involved. It must be signed in the presence of a notary public. Kentucky Divorce With Children (Packet) Step 2: The second form here, the "Entry of Appearance and Waiver," is a document for the respondent in the case. 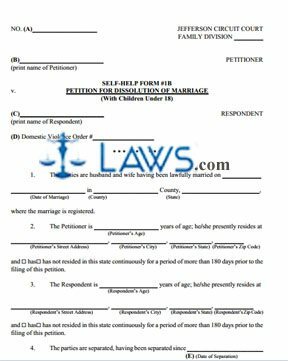 File this document if you do not contest your spouse's plaintiff and agree to submit to the court's rulings. This document also states that you are voluntarily representing yourself rather than hiring a lawyer. A notary public must be present when you give your signature. Kentucky Divorce With Children (Packet) Step 3: The third form here, the "Mandatory Case Disclosure," is an affidavit in which you detail all marital and separately owned property in your marriage, as well as all financial circumstances relating to your children. Both parties in a divorce must complete and submit this form. It must be signed before a notary public. Kentucky Divorce With Children (Packet) Step 4: The next form asks you to certify that you have provided your spouse's address to the best of your knowledge. The form following that is filed by a respondent if they agree with the details of the plaintiff's Mandatory Case Disclosure. Kentucky Divorce With Children (Packet) Step 5: The next form is a settlement agreement that can be jointly completed by both spouses if they come to agreement on all issues relating to their separation. Kentucky Divorce With Children (Packet) Step 6: The next form is a deposition which the petitioner can file to summarize their information and requests of the court. There is an additional document which can be filed to request a restoration of the pre-marriage name. Kentucky Divorce With Children (Packet) Step 7: The remainder of the documents concern judgments and resolutions in the case. These will be filed after the divorce process has begun.